Here at d takes us back to 3-4 point distant low approach, tenuki. As played, gives a staircase position special to the 6-3 point, that has occurred in pro games. 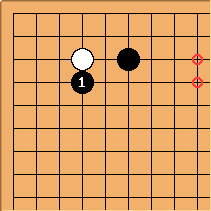 White can connect solidly, or play atari and connect starting at e.
This type of position, with an additional pincer stone in the direction of the marked points, is also now seen with the 3-4 point low approach from the wrong direction. 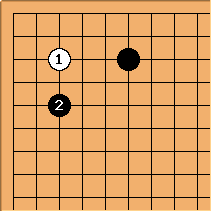 This has been played by strong players (Go Seigen, Rin Kaiho), but Black needs to be strong in one of the two marked directions. 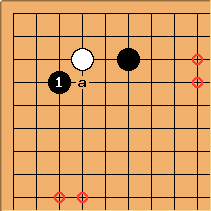 White will come out at a, through a small gap. 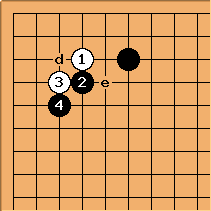 Black will then be weak on both sides, and in immediate need of back-up. This is rare in pro games. 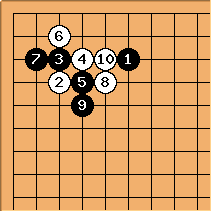 After we have a 3-5 point 3-3 approach pincer position (which is still uncommon). We could have tenuki, also.